Office space prices from RM807 per month. Located close to major financial institutes and international banks in Taman Molek, the main township and commercial hub in Johor Bahru. 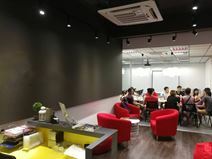 The business centre provides a variety of private and co-working options as well as a multi-purpose event space that can accommodate up to 100 people. 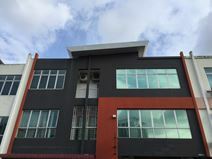 Situated in the business hub of Taman Molek, this centre has office rooms available for rent on flexible terms. There are two room types that are fully equipped with a super-fast internet connection, comfortable common area and shared kitchen area for a true "plug and play" environment. This business centre is situated in a perfect area for any business. Multiple international banks are available as well as numerous local eateries, restaurants and cafes in the local area. Offering various sized office rooms; fully equipped with desks, chairs and lockers, this mixed development building is conveniently located next to the upcoming Southkey Mega Mall, in the heart of the well established city centre. 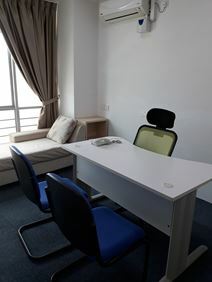 Close to two major international airports this professional business centre is strategically located within the heart of Johor Bahru City and provides a mix of private and shared fully furnished offices along with a business lounge, meeting rooms and on-site business support staff. Combining both hot desks and serviced offices suitable for businesses across all industries this Johor Bahru business centre is ideally situated for quick access to Singapore. Ample covered parking available for tenants.